By Kirsten Guenther, based on the film written by Barry Berman and Leslie McNeil. A tale of a brother trying to take care of his mentally-challenged sister and a sister trying to find herself outside of her brother's shadow, based on the 1993 film of the same name, written by Barry Berman and Leslie McNeil and starring Johnny Depp and Mary Stuart Masterson. This staging, imaginatively directed by Jack Cummings III, features Bryce Pinkham (A Gentelman's Guide to Love and Murder) as Sam, an odd introverted man the siblings "win" in a poker game and who changes their lives. He copes by escaping to the the scenes of old movies that play in his head and somehow, that is a perfect match for Joon (Hannah Elless), who navigates her schizophrenia and the two find the relationship they always have been looking for, but which they thought was impossible. Joon's brother, Benny (Claybourne Elder), struggles with this, but is it because he is protecting the sister he has cared for for 15 years following the death of their parents in a car accident, or is it because he resents the fact that she has found happiness when he has sacrificed his own? He backed away from his own chance at happiness with waitress Ruthie (and engaging Tatiana Wechsler) to stay with Joon. Would a group home -- which Joon adamantly doesn't want -- be the best solution? 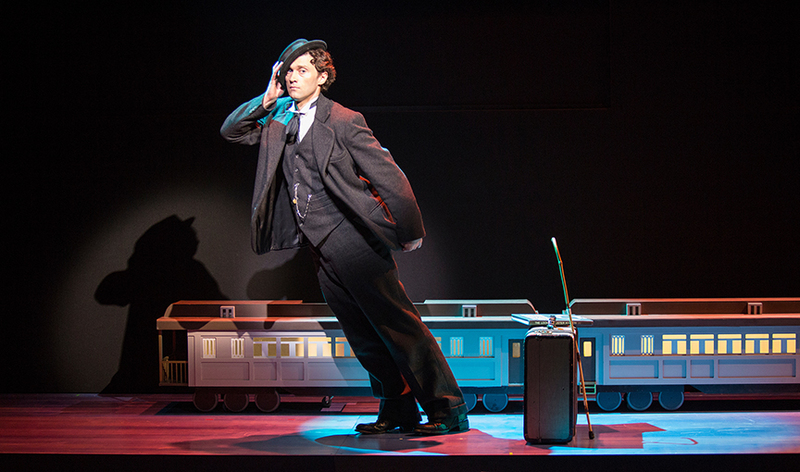 Finally, a musical with wit, warmth and whimsy. Cummings creates an environment where both reality and fantasy feel right at home. Pinkham is in his element as the Charlie-Chaplinesque loner whose character delights with a pure heart and true friendship while he quotes movie scenes (while giving impressions of the stars) and serving up food items prepared in fanciful ways. While light and breezy (with choreography by Scott Rink), the story manages to deal with serious issues through characters who are flawed, but very likable. Family and friendship are real winners here. I'd like to see this show make the leap to Broadway. The music by Nolan Gasser is pleasant if not memorable (except for the title tune which sticks). A poker-playing song seems a bit over the top. Some vocals seem stretched (though Natalie Toro, who wowed us in Broadway's Tale of Two Cities, gets a chance to soar vocally during a short solo number). Conor Ryan as Sam at certain performances,Colin Hanlon as Mike, Paolo Montalban as Larry, Natalie Toro as Dr. Cortez/Mrs. Smail, Jacob Keith Watson as Waldo/Video Store Owner and Belinda Allyn. Running time: two hours and 30 minutes with an intermission. After an acclaimed run in London's West End, the Sheen Center for Thought and Culture presents the American premiere production of Stephen Unwin's new play, All Our Children. It is Germany, 1941 and the Nazis are getting rid of children it considers to be a burden, like those with any handicaps or illnesses such as epilepsy, thanks to a program headed by Dr. Victor Franz (Karl Kenzler). He runs a clinic where parents are told their children will receive care, but instead, the children are systematically exterminated. The parents should be grateful for being relieved of their burden, according to Eric (Sam Lilia), Franz's SS agent masquerading as a doctor and the doctor's assistant. Not all are, however, especially Elizabeth (Tasha Lawrence), a mother who entrusted her son to the clinic's care over a year ago and who would desperately like to visit her beloved boy. Franz's maid, Martha (Jennifer Dundas), is oblivious to what really takes place at the clinic, but she doesn't trust Eric, who hopes to create some good Arian stock by coupling with her 15-year-old daughter. 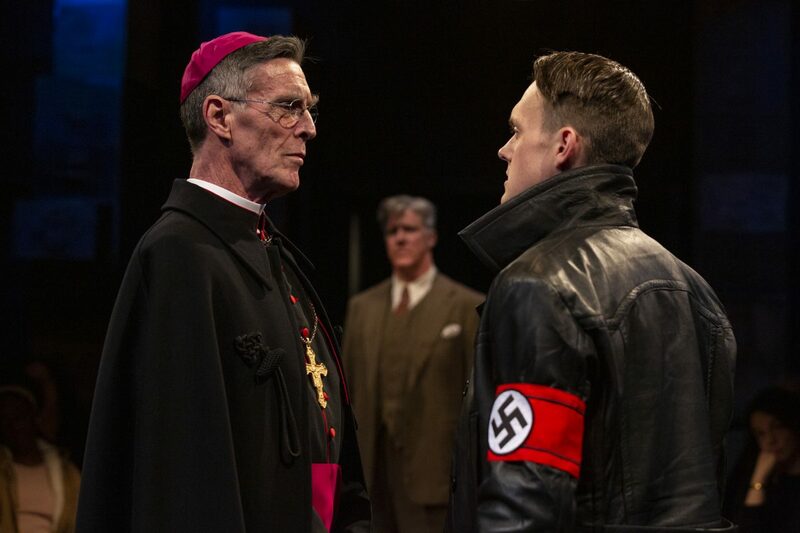 The one person who speaks out against the atrocities is Catholic Bishop Von Galen (John Glover). A glimpse at a little-known part of the Holocaust. Unwin includes all the various perspectives -- Eric represents the regime, Franz believes what he is doing is justified, Martha has no clue, Elizabeth embodies the victims and von Galen is the moral compass. The result is a thorough look at the situation. Set Designer Lee Savage's backdrop of towering file cabinets brings home the enormity of the numbers of files contained within them. Lawrence is compelling in emotional swings that range from the polite, grateful woman who brings cookies to thank the nice doctor, to the grief-stricken mother who wants him held accountable. The script could use a rewrite. The first half hour drags and doesn't make clear what is happening. While Kenzler deserves and award for the "most realistic sounding cough," we get tired of other characters commenting on it. The topic of doctors making choices about who gets to live and die is relevant in the face of recent headlines concerning after-birth abortion and euthanasia of the elderly. Von Galen was a real-life Catholic bishop who spoke out for the some 20,000 children and young persons who died at the hands of the Nazis. All Our Children plays a limited five-week engagement through May 12 at The Sheen Center (18 Bleecker St. at the corner of Elizabeth Street, NYC) in the Black Box Theater. Performances are Wednesday and Thursday at 7 pm, Friday and Saturday at 8 pm, with matinees on Saturday at 2 pm and Sundays at 3 pm. There is a special Tuesday evening performance on April 30 at 7. OPEN CAPTIONED PERFORMANCES - Thursday May 2 at 7 pm and Saturday. May 4 at 8 pm. A service for patrons with slight to profound hearing loss. One LCD screen will be visible from any seat in a section of the theater, show what the actors are saying in real time. Assisted listening devices will also be available at all performances. PARENT-FRIENDLY PERFORMANCES - Sun. May 5 at 3PM and Sat. May 11 at 2PM: At these performances, experienced caregivers will be available to look after neurodiverse children in two separate rooms for children aged 4 to 8 and 9 to 12+ so parents and caregivers can enjoy the show. Children of all abilities are welcome. "Little Differences: The Portrayal Of Children With Disabilities Throughout History" on exhibit through May 3 examines the depiction of children with disabling conditions in a variety of formats across the ages. Whether appearing in works of fine art, literature, media campaigns, or in popular culture, these children were intended to rouse the audience to action. A Yiddish translation of the much-loved musical telling the struggles of Tevye the milkman (a marvelous Steven Skybell) and his family in Tsarist Russia has moved to a new home at Off-Broadway's Stage and it probably is the best production of the musical you ever will see. Fiddler, you may ask? 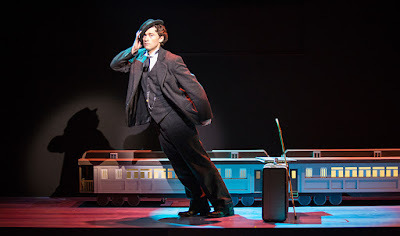 How can it be that different from the other 100 versions we have seen and which have been presented on thousands of stages since the original production, with music by Jerry Bock, lyrics by Sheldon Harnick, and book by Joseph Stein, took Broadway by storm in 1964? I'll tell you. It only takes a few moments to recognize it as the quintessential version of this musical you ever will experience. It's almost perfect in every way and feels like it's the version of this classic we have been waiting to see-- much like David Cromer's revival of Our Town became the standard against which any other productions now will be measured. Yiddish, you may ask? Yes, this musical, expertly directed by Joel Grey, is presented in Yiddish, with English and Russian supertitles projected on Beowulf Boritt's parchment backdrop. Most of us know the story pretty much by heart: Tevya struggles to uphold the traditions that have kept survival an option for his family and their little village of Anatevka. 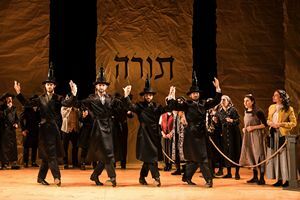 And most of us can sing the familiar tunes like "Matchmaker," "Sunrise Sunset," "Do You Love Me?," "and "If I Were a Rich Man" by heart, so the translations of Shraga Friedman's adaptation aren't needed to follow the story as much as to provide reference. It's also fun to observe at times how details vary from the traditional version: the dispute in tradition is over whether a she-goat or a he-goat had been delivered, not a horse or mule, for example. It's fascinating -- and still one of the best opening numbers of a Broadway musical ever staged. Staś Kmieć, who provides musical staging and new choreography, remains faithful to Jerome Robbins's original and iconic choreography. Beowulf's set is minimal, yet descriptive in that the parchment panels forming the backdrop to daily life bear the word "Torah." The biggest set change occurs when the parchment is torn -- a visual image of a way of life being torn apart as Russian officials begin targeting Jews for deportation. This musical is personal and we all feel the wound. For more, listen to the review here. -- No content notes. Do your self a favor and see this one. It's as near-perfect a Fiddler as you'll see. I would go back again and I don't say that about every show. For the review by Lauren Yarger, click here. Full disclosure: I am friends with a number of investors in this show. 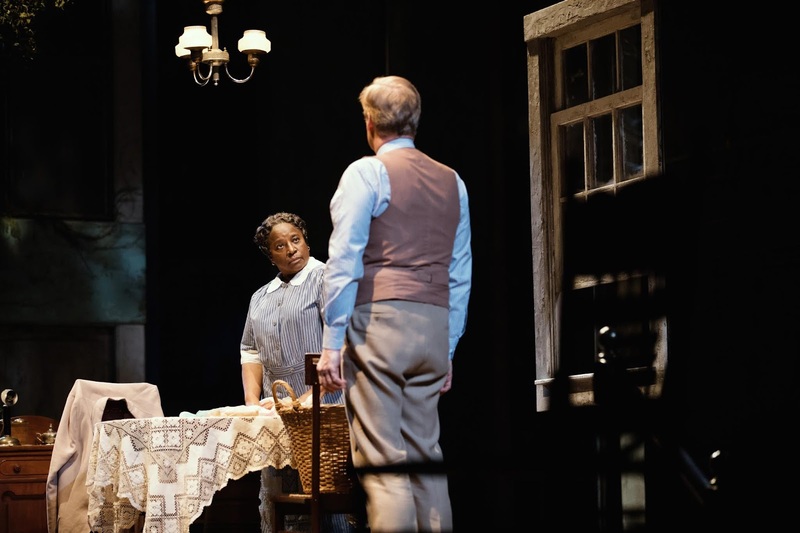 Set in Alabama in 1934, Harper Lee’s enduring story of racial injustice and childhood innocence centers on one of the most venerated characters in American literature, the small-town lawyer Atticus Finch, played by Jeff Daniels. The cast of characters includes Atticus’s daughter Scout (Celia Keenan-Bolger), her brother Jem (Will Pullen), their housekeeper and caretaker, Calpurnia (LaTanya Richardson Jackson), their visiting friend Dill (Gideon Glick), and a mysterious neighbor, the reclusive Arthur “Boo” Radley (Danny Wolohan). The other indelible residents of Maycomb, Alabama are brought to life on stage by Frederick Weller (as Bob Ewell), Gbenga Akinnagbe (playing Tom Robinson), Stark Sands (as prosecutor Horace Gilmer), Dakin Matthews (playing Judge Taylor), and Erin Wilhelmi (as Mayella Ewell). Ensemble features Baize Buzan, Thomas Michael Hammond, Ted Koch, David Manis, Aubie Merrylees, Doron JéPaul Mitchell, Jeff Still, Shona Tucker, and Rebecca Watson. Shubert Theatre (225 West 44th St., NYC. A quirky and fun rock musical reviewing events in the last year of the life of Josh Cohen (Steven Rosen) as told by Josh Cohen (David Rossmer). The stars are the book, music and lyric writers of this tale about a nice guy who cannot find a girlfriend and cannot catch a break. Suddenly, it seems as though luck might have come his way when he receives a large check in the mail from a long-lost relative. But this is Josh, the guy with all the bad luck. The check actually was intended for someone with the same name and so he begins a letter writing campaign to vent his frustration at the "other Josh Cohen." 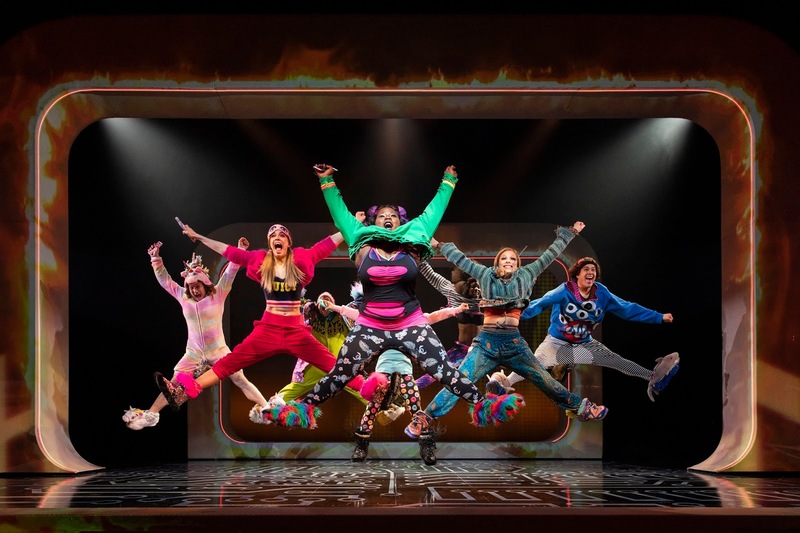 A bouncy, catchy score and smart direction by Hunter Fosters which allows interaction between the two Joshs as well as with the ensemble transforming with wigs and costumes (Costume Designer Nikki V. Moody) into a variety of characters. Hunter creates characters and scenes as if from air and seamlessly has actors switching between action and playing instruments in this fast-paced 90 minutes. Filling out the cast are (amusingly credited in the Playbill as "A Lot of People," "A Bunch of People," "A Bunch of Other People," "The Rest of the People" and "At Least One More Person" -- if that makes you chuckle, you will enjoy the show -- are Jane Bruce, Louis Tucci, Cathryn Wake, Luke Darnell and Elizabeth Nestlebrode. There is a bit of confusion at the top of the show as Josh's apartment is burglarized. the action takes place over a fairly long period of time as the audience is still entering and it is hard to know if we are supposed to be watching the action carefully or not. It's a small complaint. 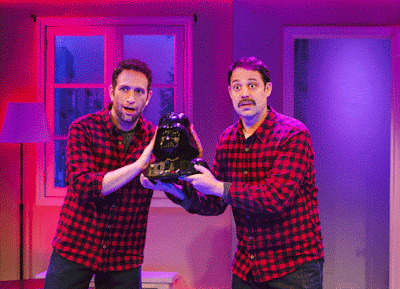 The Other Josh Cohen has been extended at the Westside Theatre, 407 West 43rd St., NYC through April 28. Scenic Designer Carolyn Mraz; Lighting Designer Jeff Croiter; Sound Designer Bart Fasbender; Music Supervisor Dan Lipton;; Co-Orchestrators David Rossmer and Dan Lipton. Musical Staging is by Whitney G-Bowley. The National Book Critics Circle (I am a proud member) will announce winners of its 2019 awards at a ceremony March 14 at The New School in New York City. The ceremony at 6:30 pm is free. Tickets to the reception following are available at http://www.bookcritics.org/awards. Look for more reviews of arts and theater-related books coming to this site soon!